Background: Extracting a decayed tooth and replacing it or trying to save it is one of the most common chief complaints, and every patient is given a variety of viable treatment options. Cost of each option plays a major role in the patient's decision. Aim: The aim was to compare the costs of three treatment modalities in the private dental clinics in Riyadh and Al-Hasa, dental implants placement to replace a missing tooth or to replace a missing tooth with a fixed dental prosthesis (FDP), or to save the tooth with endodontic treatment and crown lengthening and an FDP. Materials and Methods: An interview-based survey was done in the private dental clinics in both Riyadh and Al-Hasa. Convenience sampling was used to choose the clinics. Results: A total of 52 clinics were surveyed. Average costs of a single ceramo-metal, all ceramic and zirconium FDP were 589, 857, and 1241 S. R., respectively. Average costs of a 3-unit ceramo-metal, all ceramic, and zirconium FDP were 1595, 2329, and 3402 S. R., respectively. Average costs of randomized control trials of anterior and posterior teeth were 507 and 733 S. R., respectively. The average cost of the crown lengthening surgical procedure was 411 S. R. Average baseline cost for a single dental implant was 3907 S. R., and the average cost for placing an immediate dental implant was 2972 S. R. Moreover finally, the average cost for replacing the anterior and posterior teeth with dental implants were 3199 and 3176 S. R., respectively. Patients nowadays are faced with a variety of treatment options to replace or save a tooth, one of the most important factors in this decision-making process in the financial factor. This research's results revealed that the highest discrepancy margin in the price was for the treatment with implant therapy, followed by the replacement with a 3-unit FDP and finally the procedures to try and save the tooth. Conclusion: Treatment with implant therapy in both Riyadh and Al-Hasa is still the costliest treatment modality compared to the other modalities, but by a smaller cost margin compared to what it used to be in previous years. Extracting a decayed tooth and replacing it or trying to save it is one of the most common chief complaints the dental clinics get on a daily basis, and every patient is given a variety of viable treatment options to choose as his/her definitive treatment. The cost of each treatment option plays a major role in the patient's decision , as the prices for the dental procedures and materials are known to be on the expensive side of the scale. A decayed tooth can be extracted and replaced by either a dental implant or by a fixed dental prosthesis (FDP), or the decayed tooth can be saved with endodontic therapy alongside periodontal crown lengthening surgery and the placement of a post and core to support the FDP., When these treatment modalities are presented to the patient as all being viable options to treat the tooth; the patient will look at each treatment option's benefits and consequences, with the cost factor being a key factor in the patients' decision-making. Other factors such as the outcome of the treatment, the duration of the treatment, and the cost-effectiveness of the treatment are well documented in the literature for each treatment modality;,,,,, therefore, this research focuses on the actual costs for each treatment modality at this current time period. The aim of this research is to compare the costs of three treatment modalities in the private dental clinics in Riyadh and Al-Hasa, dental implants placement to replace a missing tooth or replacing a missing tooth with an FDP or saving the tooth with endodontic treatment and crown lengthening and an FDP. An interview-based survey was done to assess the average costs of the various treatment modalities in the private dental clinics in both Riyadh and Al-Hasa. The clinics had been chosen at random via convenience sampling from the Northern, Southern, Eastern, Western, and middle regions of each city, with a minimum number of five clinics per region in each city. The answers were documented electronically using Google forms. The encoding of the answers was done using Microsoft Excel, and statistical analysis was performed using the 22nd version of SPSS (IBM SPSS Statistics for Macintosh, Armonk, NY: IBM Corp). The frequencies of the data had been measured using the mean, median, and mode for the continuous, ordinal, and nominal variables, respectively. The dispersion of the data was measured using the standard deviation and the range for the continuous and ordinal variables respectively. Moreover, the correlations between the different variables had been done using the independent t-test, the Spearman test, the Pearson test, and the ANOVA test. A total of 52 clinics (27 in Riyadh and 25 in Al-Hasa) underwent the interview process. About 92% of the clinics considered their patients to be of the middle socioeconomic status. The average number of years since the clinics have been established was 11 years, with the newest clinic being established 1 year ago and the oldest being established 30 years ago. When asked about the costs of individual procedures it was found that the average cost of a single ceramo-metal FDP was 589 S. R. (±414), the average cost of a single all-ceramic FDP was 857 S. R. (±522), and the average cost of a single zirconium FDP was 1241 S. R. (±611). While the average cost of a 3-unit ceramo-metal FDP was 1595 S. R. (±1244), the average cost of a 3-unit all-ceramic FDP was 2329 S. R. (±1616), and the average cost of a 3-unit zirconium FDP was 3402 S. R. (±1648). The average cost of a fiber post and composite core per tooth was 400 S. R. (±317), and the average cost of a casted base-metal post and core was 400 S. R. (±322). The average cost of the root canal treatment of an anterior tooth was 507 S. R. (±201), and the average cost of the root canal treatment of a posterior tooth was 733 S. R. (±284). The average cost of the crown lengthening surgical procedure was 411 S. R. (±470). The average baseline cost for a single dental implant was 3907 S. R. (±6854), and the average cost for placing an immediate dental implant was 2972 S. R. (±2105). And finally, the average cost for replacing an anterior tooth with a dental implant was 3199 S. R. (±2390) and the average cost for replacing a posterior tooth with a dental implant was 3176 S. R. (±2303) [Table 1]. Al-Hasa had the lower average cost for all the treatment modalities except for the baseline cost of a dental implant and the cost for placing an immediate implant. 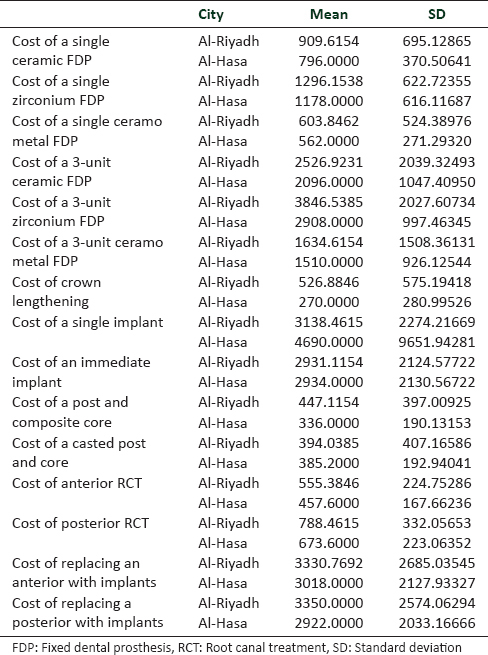 The difference in costs was statistically significant between Riyadh and Al-Hasa (P < 0.05) in the average costs of a 3-unit zirconium FDP and the crown lengthening surgical procedure [Table 2]. In regard to using the computer-aided manufacturing (CAD)/computer-aided design (CAM) systems, 22 clinics out of 52 are using them, with the average cost of a single FDP being 1280 S. R. (±956) and the average cost of a 3-unit FDP being 3239 S. R. (±1948). Al-Hasa having the higher number of clinics (12 clinics) that use the CAD/CAM systems compared to Riyadh (9 clinics) with no statistically significant difference (P < 0.05). 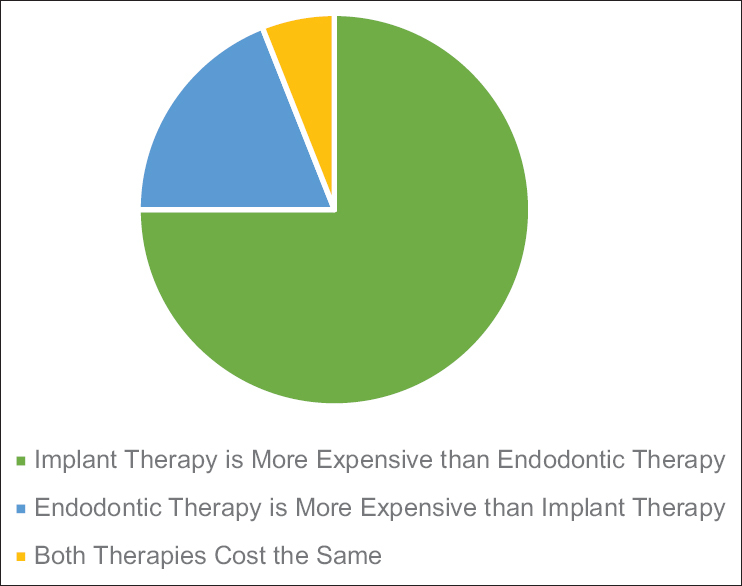 When asked to compare the cost between replacing a tooth with dental implants therapy or saving the tooth with endodontic therapy; 75% of the clinics (39 clinics) answered that dental implant therapy is more expensive, whereas 19% of the clinics (10 clinics) answered that endodontic therapy is more expensive and 6% of the clinics (3 clinics) answered that both treatment modalities cost the same [Table 3] and [Figure 1]. Given two scenarios, the first being extraction of the tooth and placement of a dental implant, and the second being saving the tooth with endodontic therapy, post, and core, crown lengthening surgical procedure and a single FDP. 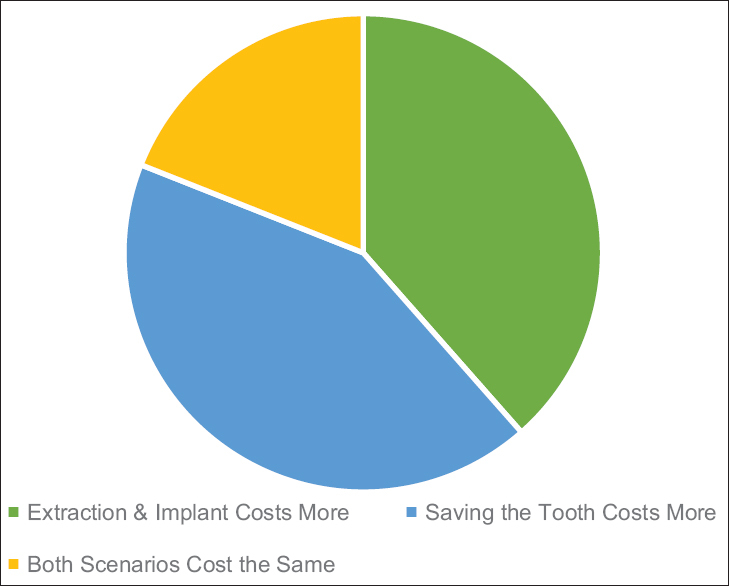 Nearly 38.5% of the clinics (20 clinics) answered that the first scenario (extraction and implant) will cost more, whereas 42.5% of the clinics (22 clinics) answered that the second scenario (saving the tooth) will cost more and 19% of the clinics (10 clinics) answered that both scenarios will have the same cost [Table 3] and [Figure 2]. 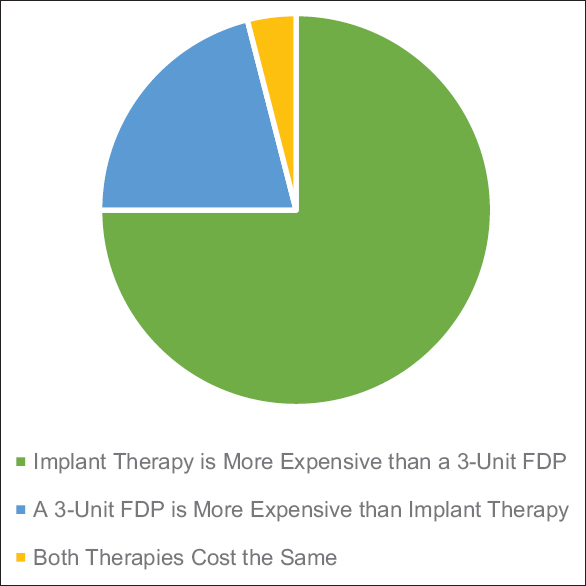 When asked to compare the cost between replacing a tooth with dental implants therapy or replacing it with a 3-unit FDP; 75% of the clinics (39 clinics) answered that dental implant therapy is more expensive than a 3-unit FDP, while 21% of the clinics (11 clinics) answered that a 3-unit FDP is more expensive than dental implant therapy and 4% of the clinics (2 clinics) answered that both treatment modalities cost the same [Table 3] and [Figure 3]. 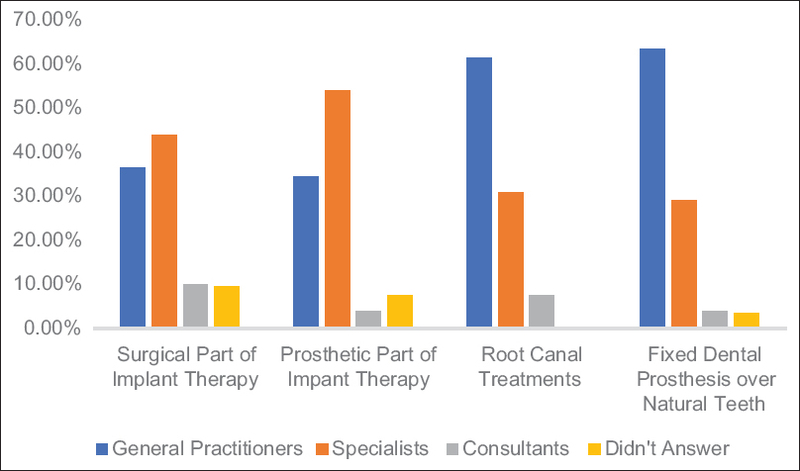 When asked about who does the various treatment modalities between the general practitioners, the specialists and the consultants, it was found the general practitioners are doing the surgical part of the dental implant therapy in 36.5% of the clinics (19 clinics), they are also doing the prosthetic part of the dental implant in 34.5% of the clinics (18 clinics) and doing the endodontic therapy and the FDP over natural teeth in 61.5% of the clinics (32 clinics) and 63.5% of the clinics (33 clinics), respectively. The specialists are doing the surgical part of the dental implant therapy in 44% of the clinics (23 clinics), they are also doing the prosthetic part of the dental implant in 54% of the clinics (28 clinics) and doing the endodontic therapy and the FDP over natural teeth in 31% of the clinics (16 clinics) and 29% of the clinics (15 clinics), respectively. Finally, the consultants are doing the surgical part of the dental implant therapy in 10% of the clinics (5 clinics), they are also doing the prosthetic part of the dental implant in 4% of the clinics (2 clinics) and doing the endodontic therapy and the FDP over natural teeth in 7.5% of the clinics (4 clinics) and 4% of the clinics (2 clinics), respectively [Figure 4]. It was found that Al-Hasa had the higher number of specialists doing the procedures compared to Riyadh, while Riyadh had the higher number of consultants doing the procedures, with no statistical significance found between the two cities (P > 0.05). The patients nowadays are faced with a variety of treatment options to replace or save a tooth, one of the most important factors in this decision-making process in the financial factor.,, This research's results revealed that the highest discrepancy margin in the price was for the treatment with implant therapy, followed by the replacement with a 3-unit FDP and finally the procedures to try and save the tooth. The high discrepancy in the implant therapy might be due to the level of education of the practitioner involved in the implant therapy, as the specialist had the highest percentage of doing both the surgical and prosthetic procedures of the implant therapy, followed by the general practitioners and finally, the consultants. The results support this notion as Al-Hasa had the higher discrepancy in the placement cost compared to Riyadh, and Al-Hasa had the higher percentage of specialists performing the implant therapy. The dentists' comprehension of the overall cost of each treatment modality can also affect the patient's decision-making as some patients will look to their dentist for confirmation. The majority of dentists in the clinics participating in this study believed that implant therapy costs more than the 3-unit FDPs, but the majority believe that saving a tooth will cost more than the implant therapy. This might be due to the multiple procedures required to save the tooth from endodontic therapy, a post and core, crown lengthening and a single-unit FDP. Also keeping in mind that the results showed the cost of an endodontic therapy for a posterior tooth costs more than that of an anterior tooth, while it showed no major difference between the costs of implant therapy to of an anterior or posterior tooth. Moreover, immediate implants are placed more frequently in the anterior teeth compared to the posterior ones,, and the study showed that immediate implant therapy costs less than the nonimmediate therapy. The treatment with implant therapy in both Riyadh and Al-Hasa is still the costliest treatment modality compared to the other modalities but by a smaller cost margin compared to what it used to be in previous years. Al-Hasa had the lower average cost for the majority of the treatment modalities compared to Riyadh. Moreover finally, the various factors including the cost of each treatment modality should be explained to the patients in details to aid them in reaching a final treatment choice. Kim SG, Solomon C. Cost-effectiveness of endodontic molar retreatment compared with fixed partial dentures and single-tooth implant alternatives. J Endod 2011;37:321-5. Al Garni B, Pani SC, Almaaz A, Al Qeshtaini E, Abu-Haimed H, Al Sharif K, et al. Factors affecting the willingness to pay for implants: A study of patients in Riyadh, Saudi Arabia. Dent Res J (Isfahan) 2012;9:719-24.
van der Wijk P, Bouma J, van Waas MA, van Oort RP, Rutten FF. The cost of dental implants as compared to that of conventional strategies. Int J Oral Maxillofac Implants 1998;13:546-53. Chun JS, Har A, Lim HP, Lim HJ. The analysis of cost-effectiveness of implant and conventional fixed dental prosthesis. J Adv Prosthodont 2016;8:53-61. Iqbal MK, Kim S. For teeth requiring endodontic treatment, what are the differences in outcomes of restored endodontically treated teeth compared to implant-supported restorations? Int J Oral Maxillofac Implants 2007;22Suppl:96-116. Iqbal MK, Kim S. A review of factors influencing treatment planning decisions of single-tooth implants versus preserving natural teeth with nonsurgical endodontic therapy. J Endod 2008;34:519-29. Bouchard P, Renouard F, Bourgeois D, Fromentin O, Jeanneret MH, Beresniak A, et al. 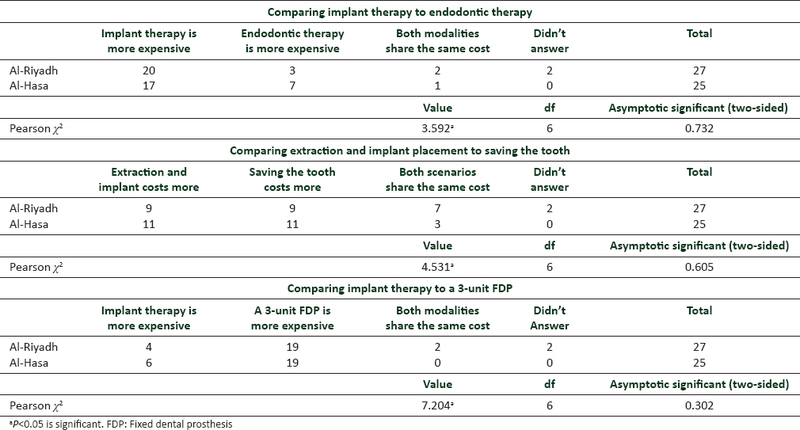 Cost-effectiveness modeling of dental implant vs. bridge. Clin Oral Implants Res 2009;20:583-7. Pennington MW, Vernazza CR, Shackley P, Armstrong NT, Whitworth JM, Steele JG, et al. Evaluation of the cost-effectiveness of root canal treatment using conventional approaches versus replacement with an implant. Int Endod J 2009;42:874-83. Ng YL, Mann V, Gulabivala K. Tooth survival following non-surgical root canal treatment: A systematic review of the literature. Int Endod J 2010;43:171-89. Alzahrani AA. Do the high costs of implants influence patients decisions? A cross-sectional study in Saudi Arabia. Clin Oral Implants Res 2017;28:138. Vohra F, Habib R. Knowledge and attitude of dentists toward implant retained restorations in Saudi Arabia. Niger J Clin Pract 2015;18:312-7. 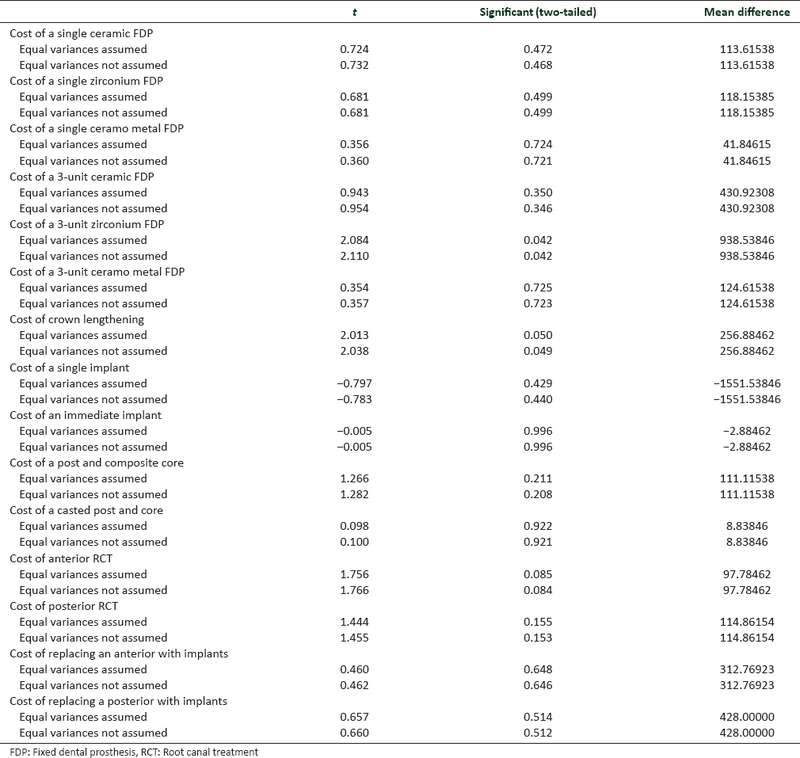 Chen ST, Buser D. Esthetic outcomes following immediate and early implant placement in the anterior maxilla – A systematic review. Int J Oral Maxillofac Implants 2014;29Suppl:186-215. Rasouli Ghahroudi AA, Homayouni A, Rokn AR, Kia F, Kharazifard MJ, Khorsand A, et al. Frequency of dental implants placed in the esthetic zone in dental clinic of tehran university: A descriptive study. J Dent (Tehran) 2015;12:906-12. Korsch M, Robra BP, Walther W. Implant counseling and information: Questions, predictors, and decision-making of patients before implant therapy. Clin Oral Implants Res 2015;26:e47-50. Narby B, Hallberg U, Bagewitz IC, Soderfeldt B. Grounded theory on factors involved in the decision-making processes of patients treated with implant therapy. Int J Prosthodont 2012;25:270-8.